Again, what does a mild deflation (I do not expect depression) do for equities? Nominal profits would drop in a sustained slow deflation, but the cash flow from these equities would be more valuable too. Thus, I do not know the net effect of a drop in nominal profits combined with deflation. A low nominal risk free interest rate, which is a characteristic of the Japanese deflation, also helps equities by reducing the discounting on the cash flow too. If deflation is mild and slow, there woudldn't be massive corporate defaults, and a lower risk premium can be assigned to the various parts in the capital structure. However, since cash flow that might be used for dividends would be directed towards debt service, this would lower the value of the cash flow to investors. The worsing macroeconomic environment, however, might be beneficial for an individual's firms prospects since debt deflation might eliminate some competitors, and give the survivors more pricing power. This might result in lower risk premiums. Unless I have good sentiment indicators (such as accurate surveys, and short interest data), I wouldn't touch equities. Equities are only good short term speculative instruments, and again, the dividend yield needs to be more than the 10 year treasury if one would buy and hold. Of course, any other conditions is simply a bet on increasing multiples. Regarding the mild deflation thesis... it is probably the "best" outcome. I do not buy a Prechter like collapse, although I could imagine the S&P 500 below 500. Do you think globalization (which increased the supply of global labor and labor competition) would make the debt harder to service since the prospect of wage increases are out? It seems like demographics and globalization might be an argument against the mildly optimistic deflation scenario. On demographics and globalization... I think demographics are an under-appreciated bearish factor for future growth in many modern economies, and globalization has already been a deflationary force (offsetting huge domestic price inflation) for a decade or two... it could become more so, but maybe rising protectionism will restrain global deflationary forces. Of course Smoot-Hawley was in 1930 and that didn't stop a near 30% US price decline then. Amazing post. 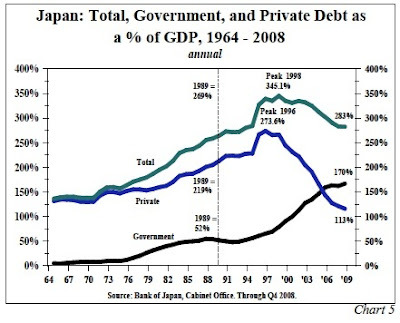 I have been trying to find Japan debt levels and how they broke down between private and public. On the comparison pre debt level crises chart for the U.S. 2007 debt you have total debt of 355%. However, that does not balance. Private total debt is listed as 288% and government total debt is 52%. That would equal 340%. Any idea where the discrepency lies? I had skipped the small "foreign" debt data from the Z1 report for simplicity. However, thanks for pointing out that this is confusing in that they don't add up — I just updated the post to include it. Deflation - key thing to understand about deflation is that it requires constantly falling wages. Not going to happen everywhere. As the private sector deleveraged in Japan, the government was able to pick up the slack with borrow and spend. Perhaps they could afford to do that because back in the early 90s their "starting point" debt to GDP was modest by current standards. 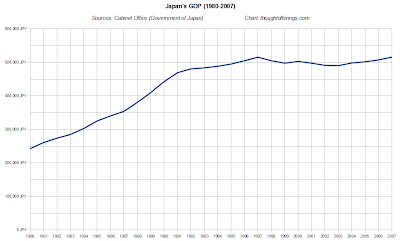 To what extent do you feel that the US government (starting as it is from a 65% debt to GDP level) now has the same degree of freedom as Japan's government had in the 90s? My own sense is that they don't and that the degree of deleveraging yet to transpire in US banks and households (which would seem to be far larger than in Japan circa 1991) only compounds the problem. 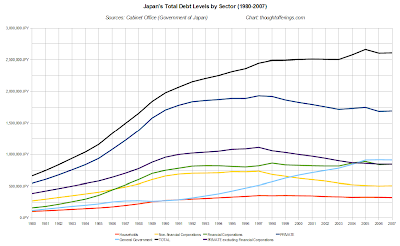 You didn't say on what basis you think the US government doesn't have the degree of freedom to offset private sector deleveraging that Japan's did... 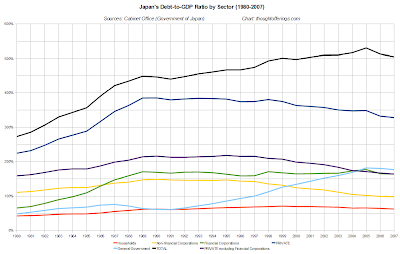 I happen to think that the US government does have just as much freedom to run deficits as Japan's did (see my more recent posts referencing Modern Monetary Theory)... or at least from an economic perspective it does -- the political comparison I'm less sure of. 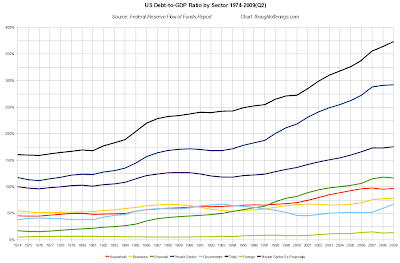 Also note in the table above how similar the starting debt to GDP of each government was (52% vs 62%), though since writing this post I've come to realize that the government debt-to-GDP number itself isn't nearly as significant as is commonly thought. And as you say, the US private sector does have significant private sector deleveraging to go, and there are additional reasons for concern, however Japan's private sector was quite leveraged also (just more concentrated on the corporate side). Five reasons concern me regarding the US government's realistic ability to offset private sector deleveraging. 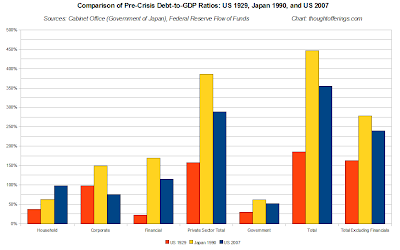 1) The US is much more dependent on foreign capital to fund deficits than was Japan; 2) As the US dollar is the world's major reserve currency, I imagine greater sensitivity of foregeign central banks to a further rapid escalation of US pulic debt; 3) If unfunded liabilites are included, the US may already be closer to a total public debt ceiling than was Japan in the 90s; 4) given the abnormally low starting level of the US savings rate (relative to Japan), any normalization of this rate combined with private sector deleveraging would seem to compound and amplify the government leveraging required to fill the void; 5) Lastly, isn't there also the question of the quality of the demand that is being cultivated or maintained by public leverage: Japan has an export oriented economy with consistent trade surpluses, the US is two thirds consumption! It's one thing surely for Japan to add public sector leverage to promote an industrial export economy. It's quite another to add public debt to essentially promote consumption and then ask foreign governments to finance it. When your central role in the world is that of consumer, doesn't it call into question the ability to finance that with debt? It has long mystified me that China and Japan continue to turn up at US treasury auctions. The argument always suggests some sort of weird sybiosis: recirculating dollars so that the US can continue to consume and buy foreign goods. At some point I think that jig is up and at least China may then focus more on the cultivation of its domestic demand. If that happens, incremental US public leveraging will be monetization. 1) & 2) The ability and willingness of foreigners to buy treasuries doesn't worry me much. For example China accumulates dollars as a result of both the trade surplus with the US and the currency peg. They can choose to buy other currencies (but that would disrupt the peg) or buy dollar-denominated assets, with treasuries being the natural choice. If the trade deficit decreases then that just means more Americans are holding the dollars instead of the Chinese, and can similarly buy treasuries. The dollars in circulation matter more than the nationality of whoever holds them. Look up Michael Pettis and Bill Mitchell -- both have covered this from different angles. 3) The debt ceiling is a political construct not an economic limit. If unfunded liabilities turn out to be too high and the obligations are not reduced, the most likely outcome would be higher future inflation (way in the future as these obligations become current) as spending exceeded capacity. This says nothing about the economic ability of the government to deficit spend now. Search for 'intergenerational' on Bill Mitchell's blog, for example. 4) I agree (and have stated in posts) that our low starting household savings rate is a more negative factor as compared to Japan. I think the real test will come if households tried to raise their savings rate quickly, and this has not really occurred so far. If it does, the test may be more political than economic. 5) To the extent that the "quality of demand" reflects a value judgment, I'm not sure that has any bearing on economic feasibility (but perhaps it does on political feasibility). And US exports HAVE been increasing... Moreover government deficits don't just support consumption spending, they can also support government spending and investment spending. Following your method I have updated the numbers, which now run from 1980 to 2009. The spreadsheet is accessible via Google Docs; see my notes at the foot of this post. hbl, note that your link to "the aggregate national accounts stock data" now turns up an error page from the Cabinet Office. Fortunately(!) the error page provides a link to their home page, and I was able to track down the data. This is an excellent post. I wanted to find data on Japan and this link popped up on Google. 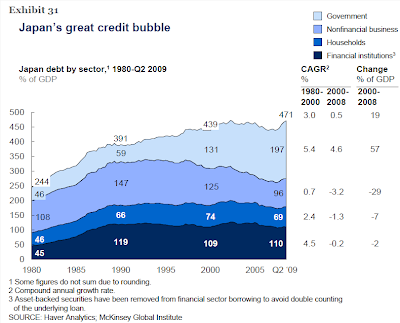 As for the US, I think it's starting to look much better in terms of the private debt issue. Financial debt is down to 89% of GDP from a peak of 123%. Household debt is down to 84% from a peak of 98%. Non-financial debt is down from 83% to 77%. It seems like the deleveraging is happening at a good rate in the US. It might even be a little bit faster than it was initially simply because the overall debt burden is less now than it was then.